By Daiyuu Nobori, SoftEther VPN Project at University of Tsukuba, Japan. We are very happy to announce that the source code of SoftEther VPN is released as open-source software under the GPLv2 license. SoftEther VPN is the underlying VPN engine of VPN Gate. The source code is provided as packages in .tar.gz and .zip formats, and is also published on our GitHub repository. You can build the full SoftEther VPN programs from the source code in Windows, Linux, Mac OS X, FreeBSD or Solaris computers. You can also generate your own customized installer packages of SoftEther VPN automatically from the source code. SoftEther VPN is a product-class VPN software suite with popularity as a tool to build on-premise or cloud-base VPNs. The binaries of SoftEther VPN were released on March 8, 2013. 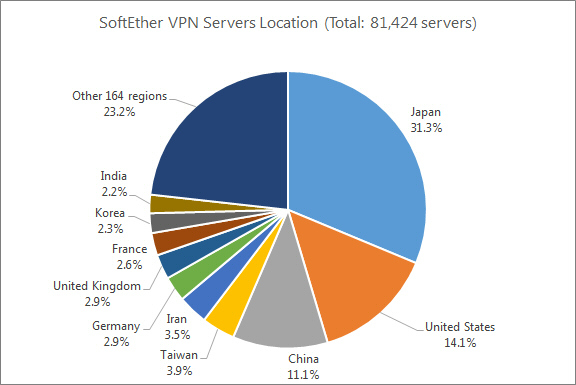 Since then, SoftEther VPN Server has been installed into over 80,000+ server computers in Japan, United States, China, Taiwan, Iran, Germany, United Kingdom, France, Korea, India and other 164 regions (*1). SoftEther VPN supports Windows, Mac, Linux, and smartphones including iPhone and Android. SoftEther VPN supports multiple VPN protocols including SSL-VPN, OpenVPN, IPsec, L2TP, MS-SSTP, L2TPv3 and EtherIP, by a single instance of VPN server program. Individual and corporate network administrators can replace their legacy OpenVPN or Cisco's VPN router products by SoftEther VPN for integration. One of the popular applications of SoftEther VPN is VPN Gate (http://www.vpngate.net/). VPN Gate is "A Volunteer-Organized Public VPN Relay System with Blocking Resistance for Bypassing Government Censorship Firewalls" (*2). VPN Gate is a circumvention tool for bypassing governments' censorship firewalls. Many Internet users behind censorship firewall, including Chinese Great Firewall, are using VPN Gate to browse YouTube, Twitter and Facebook. Daily 110,000+ unique users (estimated by the number of client IP addresses) are using VPN Gate (*4). The offense and defense between VPN Gate and Chinese Great Firewall will be reported on USENIX NSDI 2014 International Conference (Seattle, April 2-4, 2014) (*3). The text data of the source code of SoftEther VPN is approximately 380,000 lines. The total file size is 11 Mbytes. The source code includes not only the user-mode programs of SoftEther VPN, but also kernel-mode device driver codes for Virtual Network Adapter and Ethernet Bridging Module. Many developers are now able to download the SoftEther VPN source code and study the technique how to design and implement a VPN protocol-engine to achieve the high-performance, multi-protocol support VPN communication with high-level penetrating-ability against firewalls. They can also study the know-how to implement kernel-mode device drivers which access to low-level Ethernet packet processing fabric on Windows and other modern operating systems. Furthermore, because the source code is published under the traditional GPLv2 (GNU General Public License version 2), SoftEther VPN is granted to be modified, be recompiled, be embedded into derived software or hardware, or be redistributed with new branding, by any developers who have abilities to do so. We believe that easy-to-use software-based VPN tools are necessary to achieve the free Internet world. Herein, the free Internet world means that any governments cannot censor or tap over the communication of people, and people can use communication technology without any kind of fears of suppression by governments. However, implementing such an easy-to-use VPN tool has required enormous difficult effort to implement the VPN engines. By using the source code of SoftEther VPN, any developer can exploit it to build his own VPN-based application. We hope that the release of SoftEther VPN source code will help such developers, and will also help to achieve the free Internet world in future. Current geographic locations of 81,424 SoftEther VPN Server users on January 4, 2014. SoftEther VPN Server is installed on server computers around the world. The offense and defense between VPN Gate and Chinese Great Firewall will be reported on our academic paper: "VPN Gate: A Volunteer-Organized Public VPN Relay System with Blocking Resistance for Bypassing Government Censorship Firewalls" which was accepted on the USENIX NSDI 2014 International Conference (Seattle, April 2-4, 2014). The graph of number of daily unique source IP addresses of VPN Gate clients. The ranking table of VPN Gate client source locations. More details in real time: http://www.vpngate.net/en/region.aspx. To build from the source, see "BUILD_UNIX.TXT" or "BUILD_WINDOWS.TXT" files in the package, or see the following links. We use GitHub as the primary official SoftEther VPN repository. You can download the up-to-date source-code tree of SoftEther VPN from GitHub. You may make your own fork project from our project. Because SoftEther VPN is overly strong tool to build a VPN tunnel, some censorship governments want to block your access to the source code of SoftEther VPN, by abusing their censorship firewalls. We hope that you can reach one of the above URLs at least! SoftEther VPN is open source. You can use SoftEther for any personal or commercial use for free of charge. SoftEther VPN is an optimum alternative to OpenVPN and Microsoft's VPN servers. SoftEther VPN has a clone-function of OpenVPN Server. You can integrate from OpenVPN to SoftEther VPN smoothly. SoftEther VPN is faster than OpenVPN. SoftEther VPN also supports Microsoft SSTP VPN for Windows Vista / 7 / 8. No more need to pay expensive Windows Server license-fee for Remote-Access VPN function. SoftEther VPN can be used to realize BYOD (Bring your own device) on your business. If you have smartphones, tablets or laptop PCs, SoftEther VPN's L2TP/IPsec server function helps you to establish a remote-access VPN from remote to your local network. SoftEther VPN's L2TP VPN Server has strong compatible with Windows, Mac, iOS and Android. SoftEther VPN is not only an alternative VPN server to existing VPN products (OpenVPN, IPsec and MS-SSTP). SoftEther VPN has also original strong SSL-VPN protocol to penetrate any kinds of firewalls. 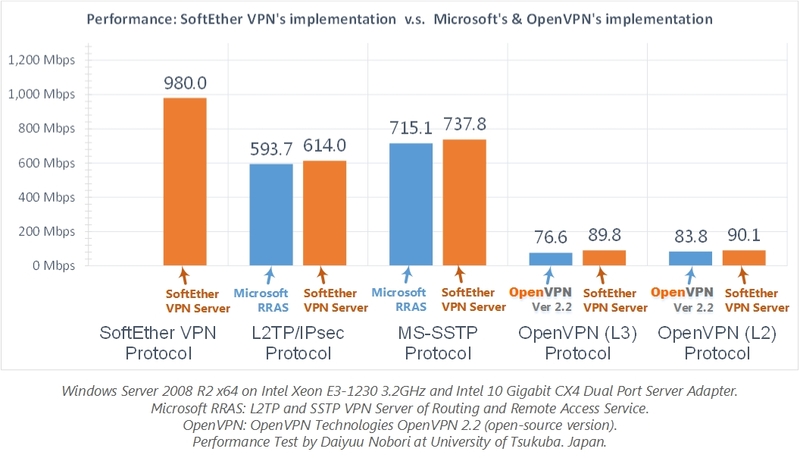 Ultra-optimized SSL-VPN Protocol of SoftEther VPN has very fast throughput, low latency and firewall resistance. SoftEther VPN has strong resistance against firewalls than ever. 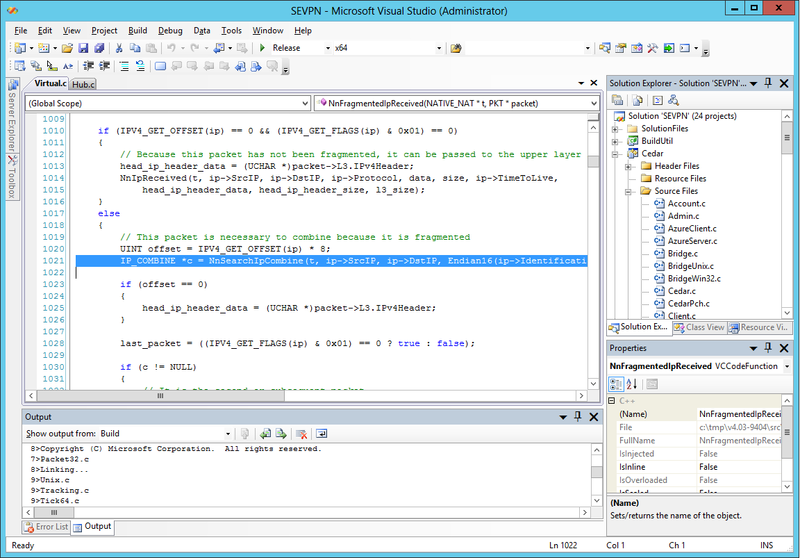 Built-in NAT-traversal penetrates your network admin's troublesome firewall for overprotection. You can setup your own VPN server behind the firewall or NAT in your company, and you can reach to that VPN server in the corporate private network from your home or mobile place, without any modification of firewall settings. Any deep-packet inspection firewalls cannot detect SoftEther VPN's transport packets as a VPN tunnel, because SoftEther VPN uses Ethernet over HTTPS for camouflage. Easy to imagine, design and implement your VPN topology with SoftEther VPN. It virtualizes Ethernet by software-enumeration. SoftEther VPN Client implements Virtual Network Adapter, and SoftEther VPN Server implements Virtual Ethernet Switch. You can easily build both Remote-Access VPN and Site-to-Site VPN, as expansion of Ethernet-based L2 VPN. Of course, traditional IP-routing L3 based VPN can be built by SoftEther VPN. SoftEther VPN has strong compatibility to today's most popular VPN products. It has the interoperability with OpenVPN, L2TP, IPsec, EtherIP, L2TPv3, Cisco VPN Routers and MS-SSTP VPN Clients. SoftEther VPN is the world's only VPN software which supports SSL-VPN, OpenVPN, L2TP, EtherIP, L2TPv3 and IPsec, as a single VPN software. 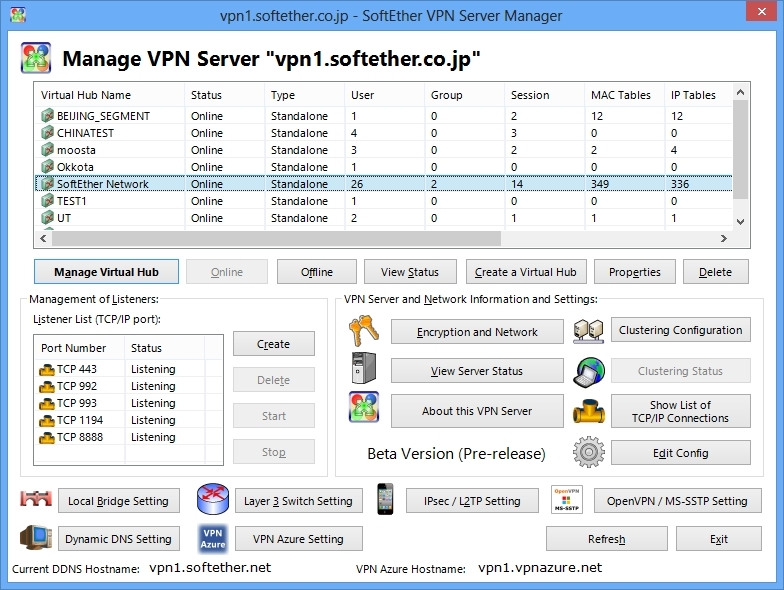 SoftEther VPN is free software because it was developed as Daiyuu Nobori's Master Thesis research in the University. You can download and use it today. The source-code of SoftEther VPN is available under GPL license. Many people have a question: what is the advantage of SoftEther VPN to OpenVPN? Obviously, OpenVPN is an excellent tool. However, the development of OpenVPN has been stalled for many years. OpenVPN has no significant improvement in recent years. 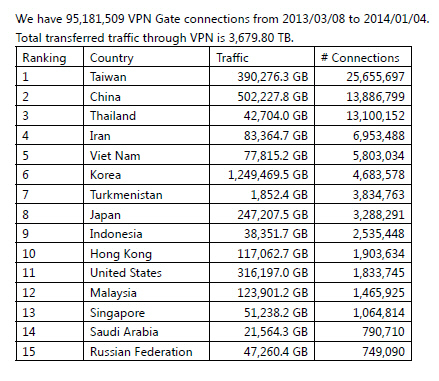 SoftEther VPN has many advantages to OpenVPN as the following table. SoftEther VPN supports multi VPN protocols and multi native-VPN clients of various operating systems. SoftEther VPN has an easy-to-use VPN server management GUI tool. SoftEther VPN has also multi-language support. There are any other advantages in SoftEther VPN. Furthermore, SoftEther VPN has the OpenVPN-clone server function. It means that any OpenVPN users can replace it to SoftEther VPN seamlessly. The SoftEther VPN Project believes that SoftEther VPN has the potential ability to occupy the position of today's OpenVPN.